Also known as PDD’s, Pervasive Developmental Disorders includes a variety of conditions. All of these conditions have similar symptoms that parents typically notice around age 3. At about this age, parents can see a slower development in their child’s abilities, especially compared to the child’s counterparts. Typically, the slower-developing aspects shows signs of not walking, talking, or developing intellectually at the same rate as other kids their age. Although these symptoms are noticeable around age 3, they actually begin much earlier and lead to multiple difficulties in growth and later development. Autism is the most common form of Pervasive Developmental Disorder. Its symptoms are almost exactly that as defined by PDD above. Children have difficulties with social interactions, communicating effectively, and also getting into repetitive behaviors. Many of these children (3 out of every 4) can have intellectual disabilities, resulting in trouble learning in school and social environments. According to studies, 1 in 68 American children have autism, clearly showing the incredible prevalence of this developmental disorder. A certain type of Autism, Asperger’s syndrome has many of the same effects as listed above. However, on the higher end of the Autism spectrum, Asperger’s Syndrome doesn’t inhibit one’s ability to speak properly. While social skills may still develop at a slower rate than one’s counterparts, his/her ability to communicate and speak with proper vocabulary is not affected. Also known as Heller’s Syndrome and disintegrative psychosis, Childhood Disintegrative Disorder (CDD) is considered another type of Autism due to its similarities. Children are affected at a young age and typically see a slower development in their motor abilities, speech, and social skills. Rett Syndrome is almost only found in young girls. 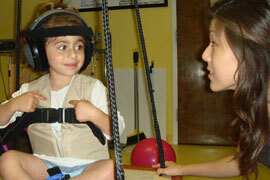 This neurological disorder affects the child’s life in almost every facet. The child may have trouble breathing, eating, walking, and talking; therefore, this also affects the child’s ability to socialize and play with other children. As with all autism spectrum disorders, early diagnosis and intervention offer the best chance for the most successful outcomes. Therapy for children with Pervasive Developmental Disorders (PDDs) should be specialized according to need. Bergen Pediatric Therapy Center combines therapies together with a team centered approach at the same location offers a complete and convenient location for the Treatment for Pervasive Developmental Disorders (PDDs). Medications are used to address specific behavioral problems and Bergen Pediatric Therapy Center works with physicians in a truly comprehensive and team centered approach. No two individuals with Pervasive Developmental Disorders (PDDs) are alike and can, in fact, have very different strengths and challenges. As a result, treatments and interventions should be highly individualized based on a thorough assessment by a qualified developmental specialist such as those at Bergen Pediatric Therapy. At Bergen Pediatric Therapy we combine all of the therapies together with a team centered by collaborating with physicians, therapists, and others involved in the child’s care. In the U.S. including Bergen County, New Jersey, the Individuals with Disabilities Education Act (IDEA) guarantees a free and appropriate public education for every child with a disability, including these.